My wife Brenda and I were to be the guest of RFU President Peter Baines and hosted and generally looked after by the Durham representative to RFU Council Robin Wannop and his wife Ann. The match day started with a pre match reception at which we were joined by John Cole of West Hartlepool RFC. John was also a guest of Peter Baines as part of the recognise the volunteer programme and had been nominated for this by Durham County. This was followed by lunch at which we were joined by former Durham University player and England captain Phil De Glanville. Our seats for the match were in the Royal Box to watch the superb England performance and Prince Harry present the cup. The evening involved being guest at the post match dinner which gave the chance to chat to and take photos with the players, coaches and officials. 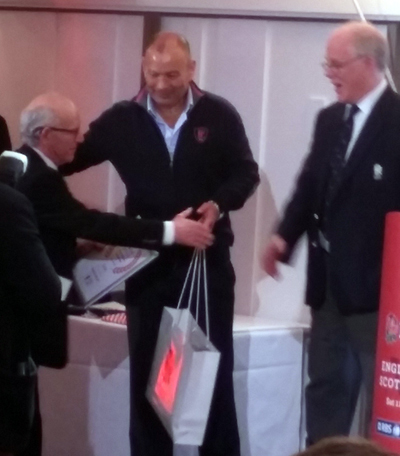 One of the main parts of the evening was the presentation of the Value the Volunteer Awards during which John was presented with his award by England Coach Eddie Jones (above). Mr Cole... very well deserved may I add. It must be awful for Willer having to do all this. We should have a whip-round to compensate him for all he's had to go through in the last few months. Well done fellas, well deserved for both of you, medal for Brenda for generally putting up with Willer and his mutterings (sorry wanderings) - club men of calibre. Many congratulations - well deserved.